East Carolina University is hoping to be lucky enough to receive an invitation from the Big 12, but right now they have a more pressing issue to address with their football program. 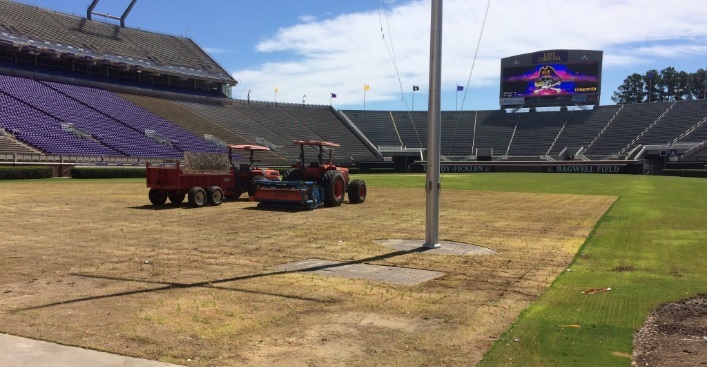 Their playing surface in Dowdy-Ficken Stadium was decimated by a Kid Rock and Eric Church concert event this weekend, meaning the school needs to work quickly to repair the playing surface before the start of the new college football season. You have to really look hard to find a football field in North Carolina that looks bad. Right now, however, all you need to do is pay a visit to East Carolina, where one end of the stadium is filled with a huge section of dead turf, which likely needs to be replaced. This is where the stage for the concert was placed. Keep in mind that concert goers were packing the field, so the green turf may be in need of some tender, loving care as well from the field crew at East Carolina. College and universities with on-campus football stadiums have been trying to find more and more ways to generate revenue from the facilities that are typically used anywhere between six and eight times a year. Concerts have become increasingly popular for such revenue opportunities, along with soccer matches and perhaps outdoor hockey games. But soccer matches are easy to clean up in a football stadium and outdoor hockey games typically have months to repair the field before spring football. Summer concerts can destroy your turf, as East Carolina found out. East Carolina will have to hurry and get the field in shape for the 2016 season. The Pirates are scheduled to host Western Carolina on September 3 for the season opener.